Four experimental Swiss musicians go east. Strotter Inst., the duo strøm and FloKa unify three distinctive performances into one extraordinary experience. It's a journey through the soundscape of music in the wide range of noise, ambient, industrial, electronic beats and contemporary improvisation. is the soloproject by Christoph Hess from Switzerland. Since 1999 he creates music through the use of old, modified, Lenco turntables which he modifies and manipulates in countless ways. Rubber bands are affixed to the rotating turntable and plucked by the stylus, records have tape affixed in patterns to create textural rhythms, electrical current is sent via live wires to the needle to create pulsing feedback. These sounds are then manipulated by Strotter Inst. through effects pedals to create warm and dense sound structures, looping, rumbling rhythms and multilayered broken beats. The music of Strotter Inst. 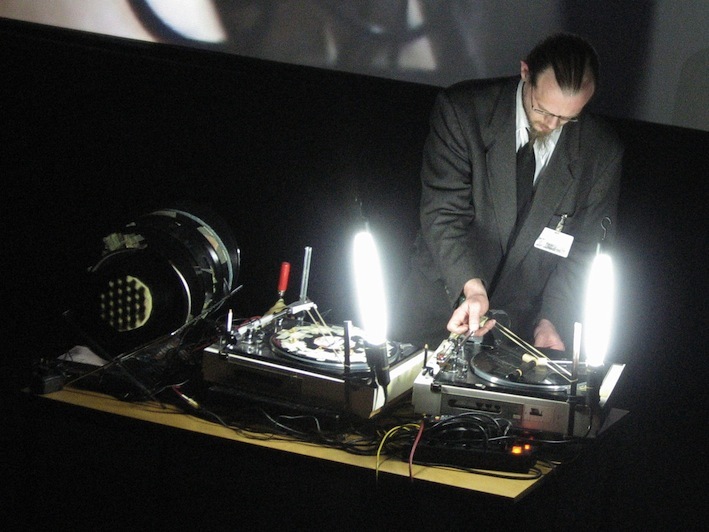 has more in common with the anti-electronica of Pan Sonic or the early minimalism of Steve Reich, than to other experimental turntablists like eRikm, Philip Jeck or Christian Marclay. Strotter Inst.' roots are not in improvised music, but in industrial culture, the electronic avantgarde and electro-acoustic composition. Strotter Inst. is also a member of post-industrial band, Herpes Ö DeLuxe (since 1995). 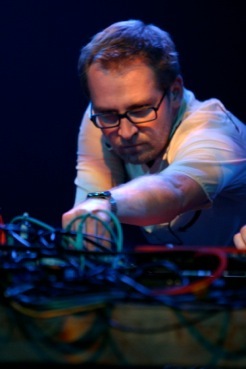 He has collaborated live with Sudden Infant, Maja Ratkje and others. Strotter Inst. has performed throughout Europe, China, Russia, United States and Bolivia. is a duo made up of Gaudenz Badrutt and Christian Müller. The Siamese twins from Bienne improvise on various electronic devices, computer and synthesizer in digital state space. Deformed by their classical formation they play the instruments not only in a common way. Their conjoined bodies are traversed and sparked by the alternating current of two minds; their music takes an unpredictable course, now flowing gently, glowing like lava, then interrupted by the occasional eruption, allowing the flow to change its course according to the spatial possibilities presented and breaking the flow down into sub-streams of sounds, allowing it to swell back to its original size. 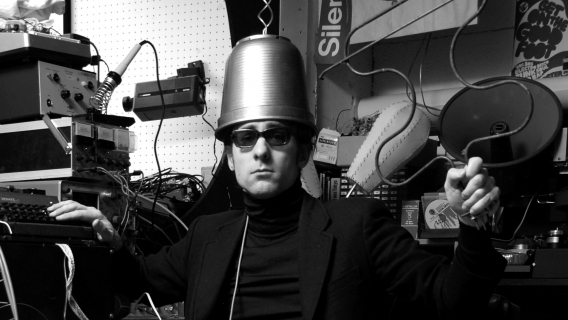 Strøm exists since 2000, performed throughout Europe, at festivals like Norberg Festival (Sweden), Taktlos Bern (Switzerland), Transmediale09 Berlin and has collaborated with Hans Koch, Clayton Thomas, Burkhard Beins, FM Einheit, Jacques Demierre, Norbert Möslang and others. New CD 'fold' released in May 2012 (label domizil). lives and works in solothurn, switzerland as "bricoleur universal" mainly interested in electronic experimental music, sound and video installations. Flo Kaufmann basically deals with and concentrates on technological stranded goods. He rearrages them in installations, objects and instruments. Vacuum cleaners that were called to be waste or mechanic typewriters match with self-made circuits and become idiosyncratic instruments. Being never really finished but always re-arrangeable they are part of Flo Kaufmanns flying electromechanic sound laboratory. "whether you call it just work, music, or art.there are two main lines in my work; technology, and the alteration of simple things to create complex objects." Der in Linz beheimatete Kulturwissenschafter und Künstler Andre Zogholy ist in experimentellen musikalischen Kontexten seit den 1990er Jahren unterwegs, dies in verschiedensten Konstellationen (u.a. Ego vs. Fux, Reichl & Partner, Egotrip feat. Didi Bruckmayr, Kern & Zogholy, MS20602040201020 oder auch mit seinem Heavydistorted-Acid-Solo-Projekt ArhizomA). Für den Soundscape Auftritt wird Andre Zogholy nach langer Zeit wieder seine E-Gitarre umschnallen und das ganze mit seinem Modularsynth garnieren. Rock the Soundscape!